SCHOTT Electronic Packaging manufactures custom-made, hermetically-sealed, autoclavable Eternaloc® connectors and feedthroughs made with Glass-to-Metal Sealing (GTMS) or Ceramic-to-Metal Sealing technology (CerTMS®). SCHOTT also produces provide sensor housings offering complete protection with a hermetic seal that helps prevent moisture from seeping into the the housing and causing damage and corrosion to internally-housed electronics components. A wide selection of Transistor Outline (TO) housings are also available. 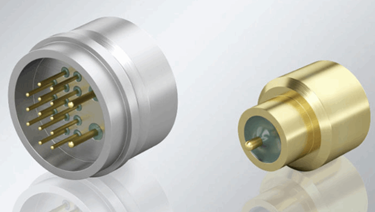 For additional information on SCHOTT’s connectors and sensor housings, download the brochure above. Superior protection with robust sealing materials: Conventional connectors that use polymer sealing materials can age quickly and become porous. Moisture can seep into the device lead to electrical malfunction or even device failure. Eternaloc® connectors using glass- or ceramic-to-metal sealing can withstand regular autoclaving while providing uncompromised protection for electrical components in devices. Proven performance in harsh conditions: SCHOTT Eternaloc connectors have been tested to withstand over 3500 autoclaving cycles without seal compromise at a temperature of 273 degrees Fahrenheit in humid heat and 2 bar pressure. New design possibilities: SCHOTT Eteranloc connectors are fully customizable to meet your application needs. Options include miniaturized designs, specialty material compositions, contact configuration, keys and/or locking features, and optical feedthrough integration, among others. Top performance for happier customers: Eternloc® connectors can withstand thousands of autoclaving cycles and maintain a fully hermetic seal at connection points, contributing to the possibility for medical devices that are significantly more reliable. Devices that are more reliable mean less warranty claims, and therefore less time, trouble and money spent on associated device repairs or replacements.